To uncover connections between brain regions and specific cognitive functions, neuroscientists have long made extensive use of techniques like functional resonance imaging (fMRI). First introduced in the 1990's, the method allows tracking the brain's activity while a test subject performs a task or responds to stimuli in the MRI scanner. To date, fMRI has been employed in thousands of studies to determine the "locations" of a wide variety of behavioral functions in the brain. In spite of this, it has proved difficult to understand specific functions and complex interaction of brain areas and networks. For regions like the hippocampus, long lists of associated tasks have been described, but so far, the many individual results have not produced a conclusive picture. A team of brain imaging researchers from Düsseldorf and Jülich in Germany now propose a new approach. The scientists are contributors to the multinational European Human Brain Project. Key to their idea is a reversal of the current practice: Instead of starting with pre-defined behavioral functions and then trying to assign brain regions, the areas would be selected first and then taken through a wide ranging statistical screening for potential behavioral associations, resulting in a "behavioral profile". Recently established large data bases of neuroimaging data provide the basis for this new bottom up approach, which, they argue, could help to reveal the "core functions" of brain areas. "These basic operational functions would be the missing link between behavioral functions described by Psychology and the brain mapping community", explains first author Sarah Genon, a researcher at University Hospital Düsseldorf and Research Center Jülich in Germany. In the European Human Brain Project, she heads the task Multimodal comparison of whole-brain maps. "Many approaches to the description of human behavior and its dysfunction, not only from the many psychology fields, but also fields like psychiatry, neurology, or economics have produced rich knowledge, but mapping them onto the brain results in a kind of conceptual chaos", Genon says. A psychologist by training who previously used fMRI to study Alzheimer's disease, she knows both sides. "It has been difficult for these fields and scientists interested in brain organization to find a common language." 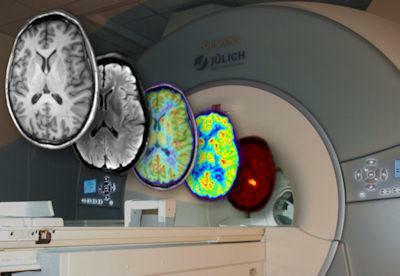 "By now many different conditions have been tested in many different people and large databases make the compiled data of tens of thousands of different imaging studies available", says senior author Simon Eickhoff, head of the area of Brain and Behaviour at the Institute of Neuroscience and Medicine at Forschungszentrum Jülich and the Institute of Systems Neuroscience at University Clinic Düsseldorf. In addition, extensive population samples have been collected by initiatives like the Human Connectome Project, the UK Biobank or the German 1000Brain study, which combine functional and anatomical brain data with anonymized results in various cognitive tests. With the data from many studies one can begin identifying the basic sub-functions that are dynamically combined into more complex behaviors. "Basically we can now approach the middle level. This has been somewhat in the dark, compared to what is known from measurements about the microscopic level, like the neurophysiology of cells, and the higher functions of complex behavior." This focus of bridging between the different levels of brain organization is very much in line with the broader goals of the Human Brain Project, Eickhoff explains. With around 500 contributing scientists all over Europe, the project aims to set up a framework to understand the brain's complexity in a more unified way. The work in functional mapping will be integrated into a web-based 3D-Atlas that can be zoomed through all scales and reflects many different aspects, from genetics, cells and networks all the way up to a regions behavioral involvements. The authors are involved in the European Human Brain Project, a H2020 FET Flagship Project which strives to accelerate the fields of neuroscience, computing and brain-related medicine. This acceleration will be achieved by a strategic alignment of scientific research programmes in fundamental neuroscience, advanced simulation and multi-scale modelling with the construction of an enabling Research Infrastructure. In the project, they contribute to the construction of the world's most comprehensive multimodal 3D atlas of the brain. Co-author of the article is Prof. Katrin Amunts, Scientific Director of the Project.